Jefferson Dog Park Now Open! IMPORTANT! This is a DIY pilot project so there are no services, so bring your own water and take your dog poop with you! 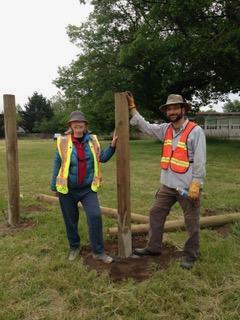 Over a dozen volunteers put in fence posts, strung fencing, and spread mulch to get the JDP ready to go. While the park is not officially open until August, it is accessible now. After three years of hard work and collaboration between the JWN and the Parks and Open Spaces, work will start in May and we anticipate the park opening in July! Our Neighborhood Matching Grant proposal to develop Jefferson Park- a city owned, undeveloped parks space on Jefferson Alley between 15th and 16th Aves, into a partially fenced dog off leash area (DOLA) was approved in April. To get on the email list for information and volunteer opportunities, contact Tamara Crafts: jefftamara@gmail.com. Next Post: Join Us for our Summer Events!